Review: "How Like an Angel"
Lincoln Center is currently in the throes of shedding light on New York City with their magical white light festival. Their international line up of diverse programming speaks to innovative artistic director Jane Moss's sense of good taste and excellent choices, of which I am sure there were many possibilities. Thursday I saw, How Like an Angel at St James Methodist Chapel on the grounds of Bard at 121st and Broadway. 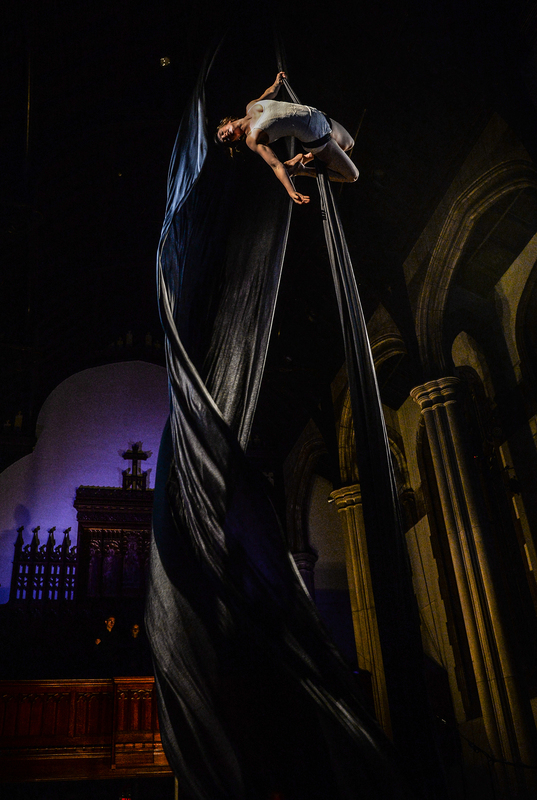 An evocative setting wonderfully appropriate for this acrobatic & vocal ensemble to be presented. After mistakenly drinking caffeinated coffee in the West Village, I was grateful to be standing for this performance of trapeze artists and singers who were supposed to weave in out of the audience, however, I found the need to stand not only annoying, because I couldn't always see and was shoved in the arm to move aside by an overzealous usherette, (for what I don't know) since there was little flirtation with the crowd in terms of merging. It seemed that the center of the room and the balcony and stage were the most utilized areas for the performers, and if sitting, the sight of these outstanding acrobats twirling in long sheets of fabric from the ceiling, throwing themselves furiously to the ground and climbing up and down poles like monkeys might have been all the more glorious. That being said, Director Yaron Lifschitz of Circa does an imaginative job of staging the movements while using the environment and performers fully: Rowan Heydon-White, Birdie Hooper, Rudi Mineur, Kathryn O'Keeffe, Paul O'Keeffe, Skip Walker-Milne, and Billie Wilson-Coffey, all of whom have astonishing physical instruments. Music Director, Robert Hollingworth of I Fagiolini presents a myriad of Godly tunes in the medieval style befitting the chapel experience, which was mostly quite complimentary to the scenes before us. However, the 'out of the air' event of the, though beautifully sung, South African gospel song "Umsindisi" seemed odd in the middle of all these slow moving and expanded vocals, and without the joy of the truly religiously dutiful, the quire fell flat in its presentation. How Like an Angel is a celebration of the body in its ability to make the physical, spiritual, and musical connection to endless possibilities, no more description than that is necessary. All in all, the onlookers were superbly satisfied.